I’m in Toronto and obsessed! A week ago, the therapist giving me a Swedish full body massage barely paid any attention to my feet, and I have been unsatisfied ever since. Like that song that gets stuck in your head, my craving for foot therapy will not be denied. I decide it is time for reflexology. And what better place to find it than in Chinatown? The mother of all satisfying foot rubs is Reflexology. It even comes with a map! Sometimes referred to as acupressure or zone therapy, reflexology began over four thousand years ago in Egypt. 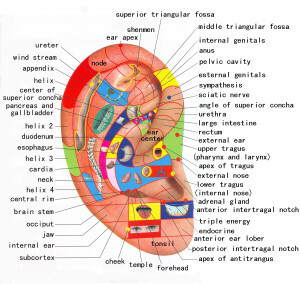 It is based on the concept that specific areas of the feet, hands and ears represent different regions, glands and organs of the body. Hooey? Well, it depends on who you ask. One thing is for sure: It’s popular. Denmark reportedly uses it more that any other form of alternative therapy. Massage or science? Call it want you want – it improves circulation and relaxation, which supports the immune system. It is also non-invasive, thus perfect for people with physical mobility limitations (post-surgical, pregnant,or elderly peeps), and those who don’t like mainstream body massage. 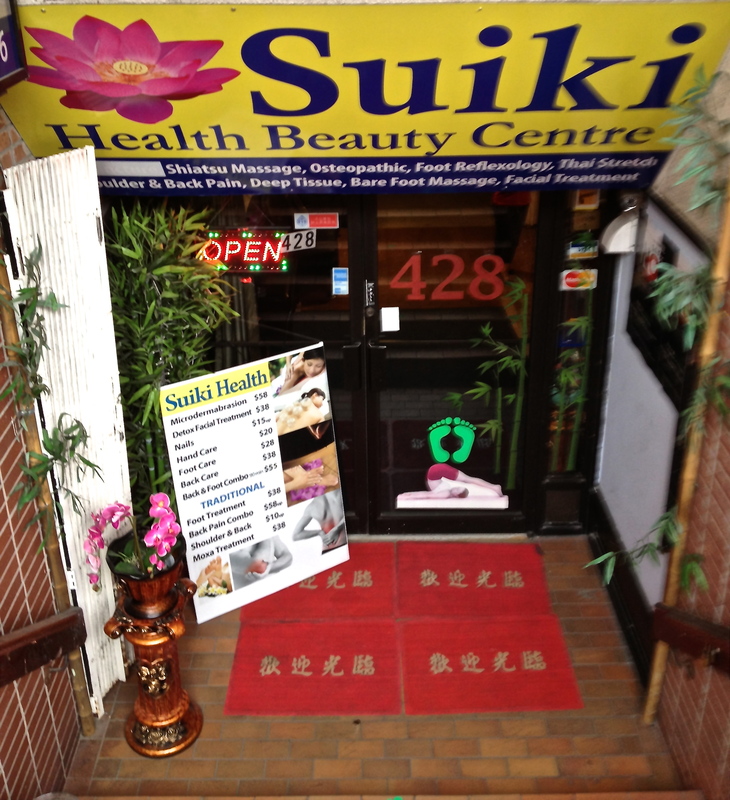 I emerge from the cab in Chinatown and discover that I am mere steps away from a massage salon called Suiki, which scored four stars and has seventeen favorable reviews on Yelp. 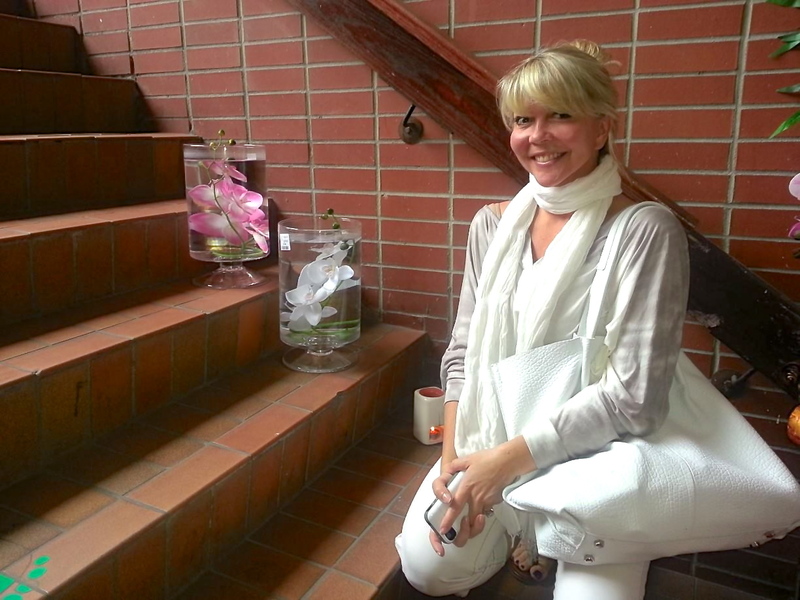 And as if that weren’t enough, plastic orchids floating in large glass hurricane vases with price tags still attached, and a small candle burning in a chipped ceramic holder adorn the steps leading to the entrance. The chintzy-ness is somehow charming. My friend, Sheryl, who agreed to join me on my adventure, smiles and gives a nod of approval. Upon entering Suiki, I am pleasantly relieved to see how clean it is. Knowing my tetanus and hepatitis vaccines are up to date, provides me with an additional sense of security. 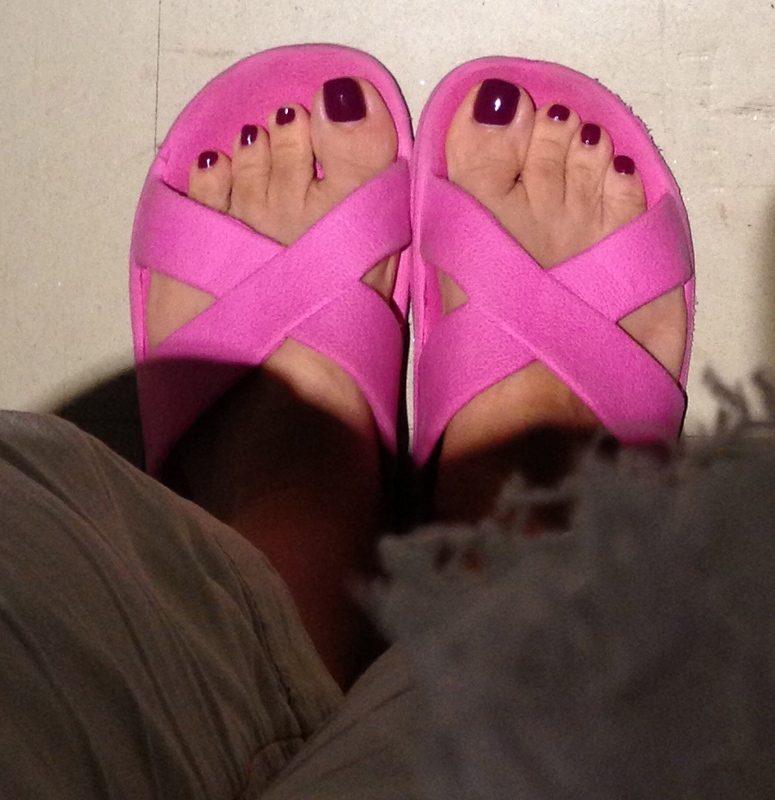 I am asked to remove my shoes, in exchange for groovy pink rubber sandals. 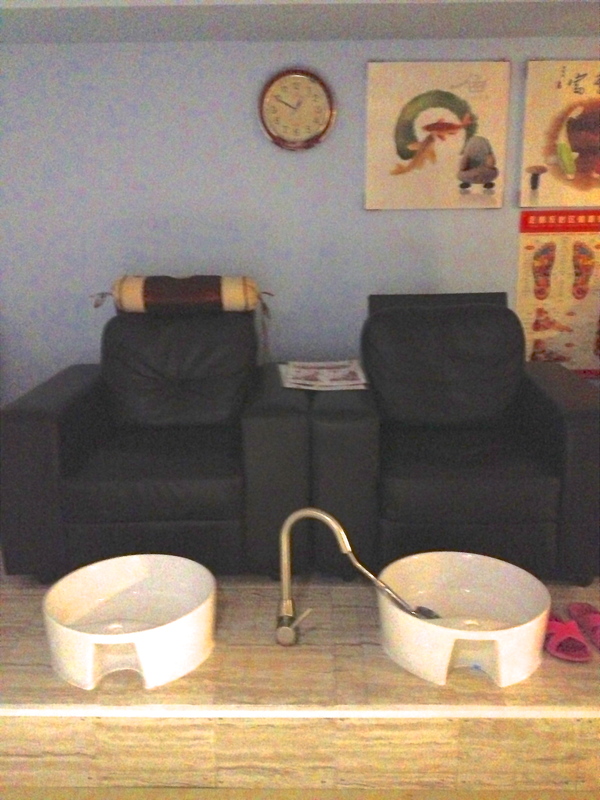 Then we are guided to a dimly lit treatment area with two large chairs on a platform, ala nail salon seating. Easy-listening organ music plays over the sound system – the full-blown bohemian freak factor is delightful. 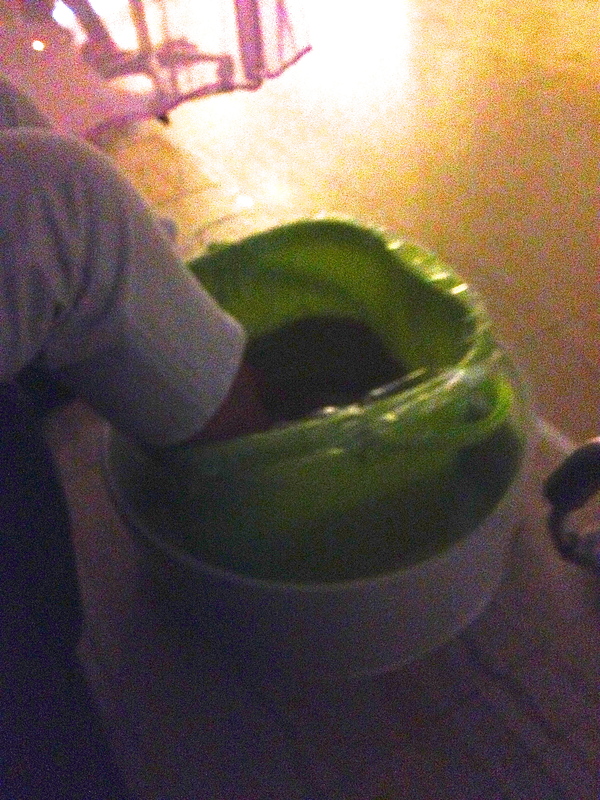 We soak our feet in plastic-lined green buckets of liquid. It takes a second to realize that the texture of what I am “soaking” in is not identifiable. Not water. Paraffin? Gel? Jello? When we ask the woman for the name of the substance, she responds only, “yes”. Maybe it’s for the best. After ten minutes in the mystery muck, two sweet little smiling-ladies appear with large square cushions, and in unison lift our feet from the buckets and insert cushions under our legs. It looks as rehearsed as a formal tea ceremony. Lotion is never used in authentic reflexology, so I am both relieved and disappointed when cream is applied to my foot. Disappointed by the lack of authenticity, but relieved because traditional dry reflexology hurts a lot. They knead, twist and knuckle our soles to upbeat versions of “Never On Sunday” and “Zorba the Greek”. My toes, ankles and even my knee caps get full attention. This woman knows what she is doing! Areas that normally hurt when my feet are massaged do not hurt today, except for my arches. 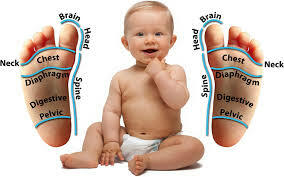 Reflexology charts suggest that if my arches hurt, then I may have issues in my lower back or colon. However, I attribute this tenderness to my summer flip-flop habits. Who knows and who cares? The sixty minutes fly by, and before I know it, my lower legs are being thumped – the universal massage sign for “I’m so glad we had this time together….”. Leaving Suiki, I feel relaxed, refreshed and satisfied. There is a buoyant lightness to my step as I walk down Dundas Street. Just what I needed! I’m ready to explore Toronto. Now, if only I could get the song “Zorba the Greek” out of my head.